OLIVIER GIROUD kept up his goal-den spell last night in a stormy clash. The Frenchman equalised an Edinson Cavani goal from the spot just before halftime to make it five goals in five games, before a Marco Verratti own goal put the Gunners ahead.But Arsenal will go into the final round of Group A games in second place behind Paris St-Germain, who equalised after Alex Iwobi deflected a Lucas Moura effort past his own keeper 13 minutes from time.Three of Giroud’s strikes had come after he had been summoned from the bench, including Saturday’s last-ditch equaliser at Manchester United.But he was back in Arsene Wenger’s starting line-up for the visit of PSG. He looked far from rusty as he sent Alphonse Areola the wrong way with his spot-kick, the keeper diving to his left. It was a night when the red shirts of Arsenal really got the player nicknamed ‘The Matador’ going. Striker Cavani put PSG ahead, then got embroiled in flare-ups with home players following the awarding of the penalty. He argued with Aaron Ramsey and cuffed the Welshman on the chin, escaping punishment for an action which enraged Wenger’s players. At half-time, as he entered the tunnel,Giroud squeezed him around the back of the neck, with an angryCavani knocking the Arsenal striker’s arm away.Cavani had punished the Gunners with an 18th-minute goal as the home side started by suggesting their manager Wenger’s “stuttering” description of them was spot on. In big domestic games this season, against Tottenham and Manchester United, the north London side have been far from convincing, with both games ending in 1-1 draws. They began this crunch Euro clash once again suffering from a disturbing lack of inspiration with PSG keeper Areola having a relaxed time of it at the Clock End of the Emirates until the penalty. Arsenal knew victory would see them guarantee top spot in Group A, with a game to go, and increase the prospect of avoiding one of the European giants. For the last six years they have gone out at the first knockout stage, twice to Barcelona and twice to Bayern Munich. At first they looked very unlikely toachieve that.In the 16th minute Kieran Gibbs was in the right place to clear off the line when Lucas’ cornerwas flicked on byCavani and the ball struckThiagoMotta and zipped goalwards.Two minutes later, the French side went ahead after they cut open the Gunners’ backline with ease.Motta sent a low ball directly forward into the path of Blaise Matuidi and he rolled Shkodran Mustafi to set up Cavani, who got away from Laurent Koscielny to slide and poke the cross home. It took the Uruguayan striker’s tally for the season in Europe to five. 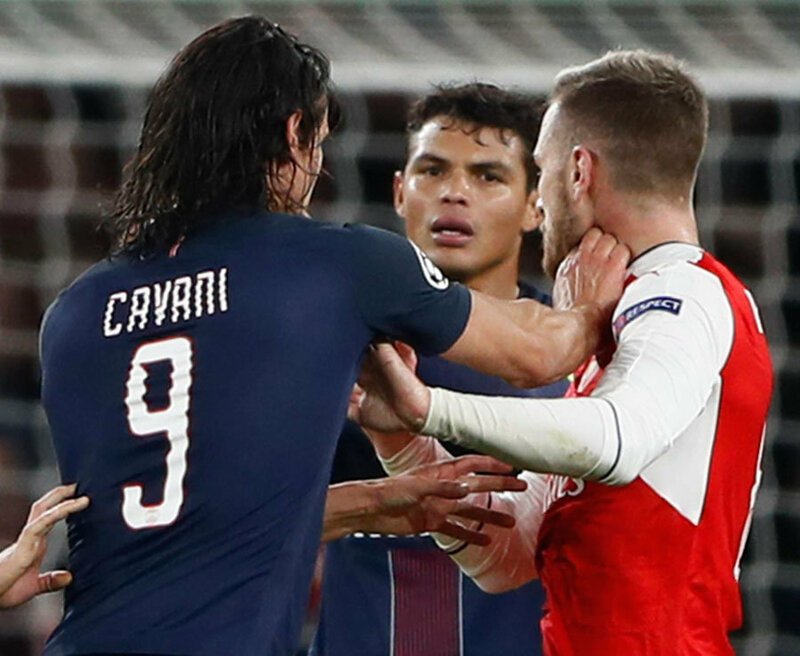 Cavani scored in the meeting in Paris and also fluffed other chances, but he was not going to fail from close range. Then came the unexpected equaliser. Giroud robbed Motta and when the ball broke to Mesut Ozil he conjured a superb reverse pass to Alexis Sanchez on his right. The Chilean tried to deceive Grzegorz Krychowiak by cutting back on to his left foot and was caught by the Pole. There was not a great deal of contact, but Sanchez went down with PSG clearly believing he had made the most of it.The lively Lucas struck the top of the bar with a free-kick in the 54th minute after hehad been fouled byKoscielny, who had lost possession near his goal.Then the Gunners went ahead in the 60th minute with a pure fluke.Carl Jenkinson drove in a ball from the right and Ramsey miscued a shot. But as Marquinhos attempted to clear, he fired the ball at Verratti and it rebounded off the Italian’s leg and into his own net. 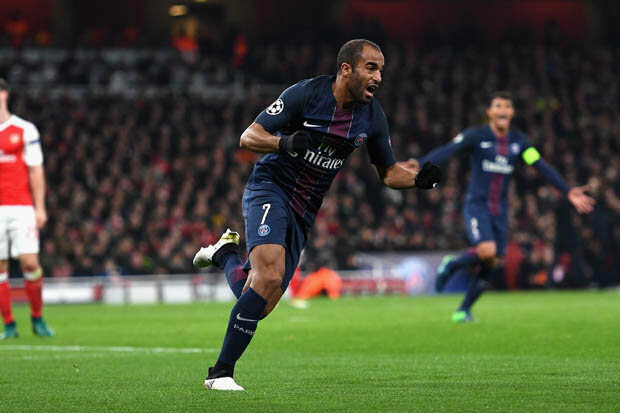 PSG also got lucky when Lucas’ far-post header from a corner was going straight to David Ospina before Iwobi intervened with a header, diverting it into the net.